Mercurio Gallery presents Ken Faulks at Coast Collective Art Centre, May 16-27, 2012. New works by virtuosic oil painter Ken Faulks enliven Coast Collective Art Centre May 16-27. Recent paintings from Ken’s road trip through BC and Alberta complement his local landscapes and abstractions. Artist in attendance at majestic Havenwood mansion on Saturday, May 19 from 2-5 PM. Presented by Mercurio Gallery. Info at www.mercurio.ca or 250 388-5158. Kym Hill moved Mercurio Gallery from Courtney Street in Victoria to the heart of Metchosin in September, 2011. Her new location is large and bright, with ample space to display of her eclectic collection of Limners and contemporary artwork. Kym Hill enjoys the sense of bravado and confident brushwork that make Ken’s paintings “precious gems”. Ken’s abstractions contain the same potent energy as his landscapes. 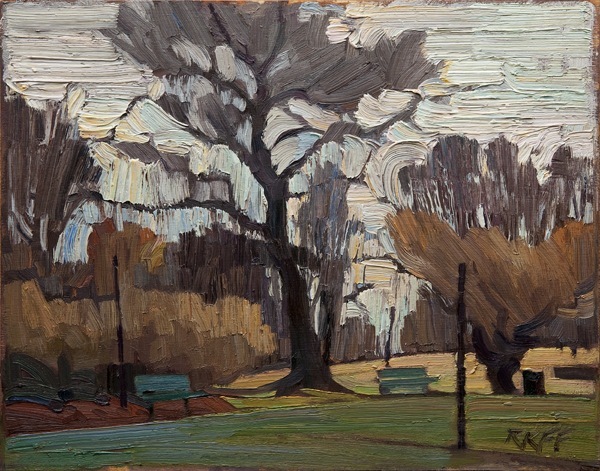 Many of Ken’s fresh new works have already sold to collectors in Alberta and BC. Two previous solo shows of Ken’s work at Mercurio have been very successful. Snowy Drive, 36 x 48in, oil on canvas, 2012 with artist Ken Faulks. 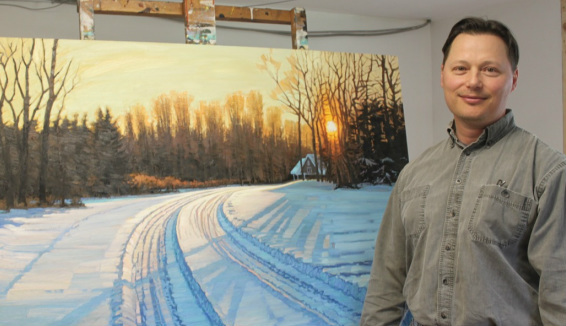 Ken Faulks is a full-time visual artist with a background in graphic design. Ken is comfortable tackling larger pieces. Snow Clouds, 4ft x 6ft, oil on canvas, 2012. Snow Clouds (4x6 feet) is one of the largest pieces in the exhibition. Having completed several murals in his career, Ken is comfortable tackling larger pieces. “I love to paint big turbulent skies tumbling over a low horizon,” he says. The strong prairie light and crisp snow scenes invigorated the artist during his road ramble through Alberta. Big Cloud, Near Wabamun Lake, 11 x 14in, oil on panel, 2011. His palette board seldom dries out, thickly coated with his favourite hues: brown umber, viridian green, alizarin crimson, yellow ochre and cadmium red and yellow. 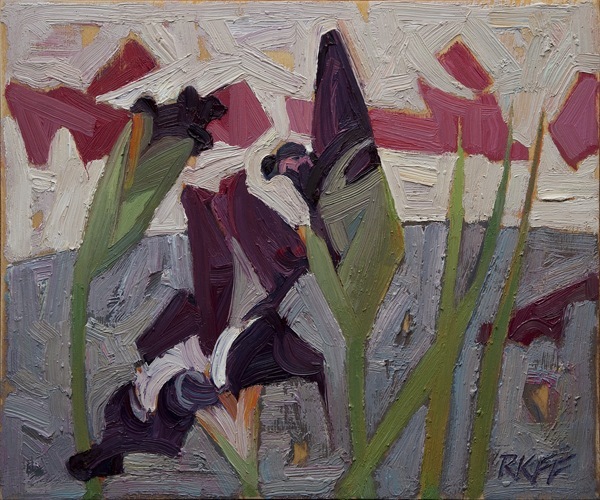 Government House Irises, 10x12, oil on panel, 2011. Beacon Hill, December, oil on panel, 11x14in, 2011. Andrew Wooldridge, Philip Mix and Adam Noonan. *All photos of artwork courtesy the artist. Kate Cino previewed arts events for 18 years at Boulevard magazine. She has a History in Art degree and a Public Relations certificate from the University of Victoria.